The first book in the current series ‘Unlikely Soldiers’ is set in nineteen seventies Britain. The second published May 2016 covers the early eighties and includes the Falklands War, service in Northern Ireland and (the former) West Germany. Deb now spends her time writing, working part-time, avoiding housework and playing tour guide along with Allan. She also occasionally blogs from Donut the dog’s point of view. 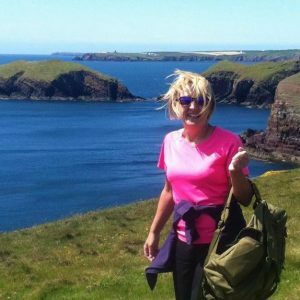 Deb tries to keep the pounds off by playing netball and long-distance walking. An overactive imagination and the need to get my stories out there. I started out writing personal poems/rhymes for friends to surprise their loved ones at special occasions (birthdays/anniversaries/weddings etc). Then wrote the lyrics for twenty odd songs and started writing children’s books. From there I progressed to adult books. One of my proudest achievements was co-writing a song for our 25th wedding anniversary. My husband was overcome with emotion when I presented it to him, and even though the lyrics are very cheesy, he absolutely loves it. The easiest part is the first draft, creating the characters and getting the story onto the page. I start with a plot outline but it very rarely survives first contact! The editing process is definitely the hardest part. I proof read/edit at least four times, twice before my editor receives the book and at least twice afterwards. My characters talk to me, especially when something’s not quite right. This usually happens when I’m trying to sleep and I have to resolve the issue otherwise it’s impossible to nod off. Make sure your book is the best it can be. If you want to be taken seriously hire professionals to help. Write and rewrite your blurb and ensure your Amazon Author Page is kept up to date. Join online groups/forums where you can meet other Indie Authors and swap ideas. I publish through Amazon. Their popularity and customer service are second to none so it was a no brainer for me. It’s dynamic so the only thing guaranteed is change.